Our timing belts and pulleys offer a positive drive through the engagement of the molded teeth in the belt with accurately spaced grooves on the pulley. The action of the belt teeth entering and leaving the pulley grooves is positive, smoother operating and more silent than other types of drives. We manufacture timing pulleys from quality ferrous and non-ferrous materials such as steel and aluminum alloys material, cast iron, stainless steel and many more materials. 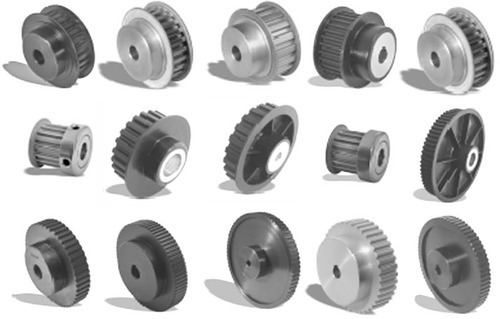 We offer the best quality timing pulleys at very economical rates. These pulleys are available in various sizes as well. We also offer timing pulleys customized as per our clients' requirements and specifications. Our timing pulleys go through stringent quality checks before being dispatched to our clients. Shri Krishna Engineering Works as established in 2012 as sole proprietary firm. We are renowned manufacturer, supplier, exporter and trader of Chain Pulley Block, Electric Hoist, Winch Machine, Electric Chain Pulley Block, Crane, Material Handling Equipment, Lifting Accessories, Material Handling Trolley, Pnewmatic Tools Accessories, Slings, Hydraulic Jack, Coupling, Hydraulic Lift, Gear Box, Chain Sprocket, Safety Accessory, Industrial Machines, Hacksaw Machine, Sheet Metal Machine, Wire Nail Making Machine and many more. We ensure that these products are made from good quality material, so we go for the selection of a strong vendor base. Selection is done only after cross checking financial stability and timely delivery schedules. He is even judged on total cost approach and must provide for long range improvements. This helps in bulk production. By meeting bulk demand we are able to cater to cater to our clients more effectively. Our major markets are Asian countries and Indian Subcontinent.